Sockeye salmon range from Oregon to northern Alaska and most typically weigh between 5 and 10 lbs. They have a relatively high fat content and are valued for their deep red flesh and high omega-3 levels, the highest of any salmon. 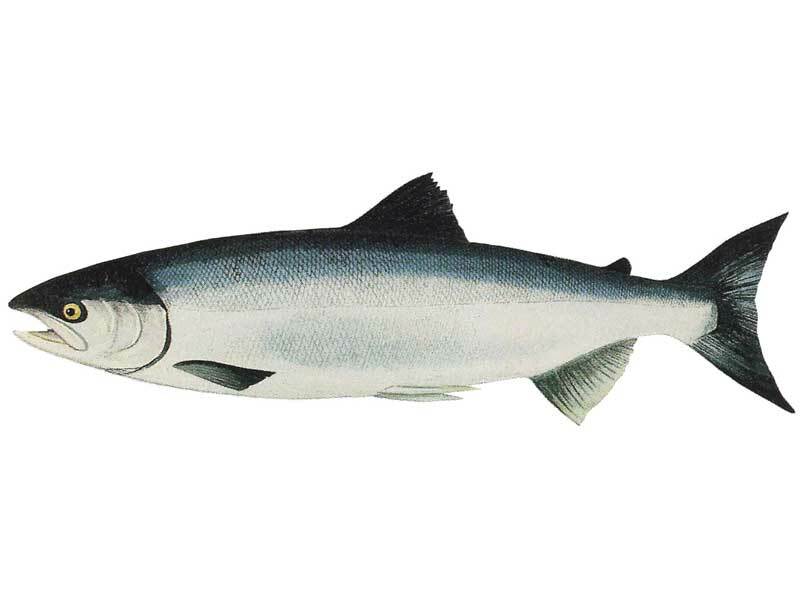 Like all Pacific salmon, Sockeye are born and die in fresh water. They are born in streams far inland from the ocean that tend to have lakes associated with them. They may spend up to three years in those freshwater lakes before travelling downstream to enter salt water for the first time, then will spend the next one to four years in the open ocean. Unlike other Pacific salmon, sockeye tend to feed extensively on zooplankton. It is thought that this diet, combined with that of other small organisms like shrimp, account for the deep red color of their flesh. When the time comes for the long migration back to their spawning grounds, they stop eating altogether and live off their reserves of fat. Their skin starts to change color once they reach fresh water, although initially at least this does not have a significant impact on their meat condition. As they head further upriver and get closer to their spawning grounds however, their flesh starts to deteriorate and they develop the prominently hooked snout they use in mating. Sockeye salmon, like all Pacific salmon, only spawn once before they die in the stream of their birth. The majority of Sockeye are caught with gill nets and sold head off, as the nets scar their heads. Troll fishing is taking a larger and larger percentage of the catch though since the fish come out of the water in better condition and they can be sold with their heads on.